This post was created in collaboration with our friends at Thrive Culinary Algae Oil. What does that even mean? In music, when someone yells ‘Drop the beat’ they mean turn up the bass – make something better and just feeeeeel it. 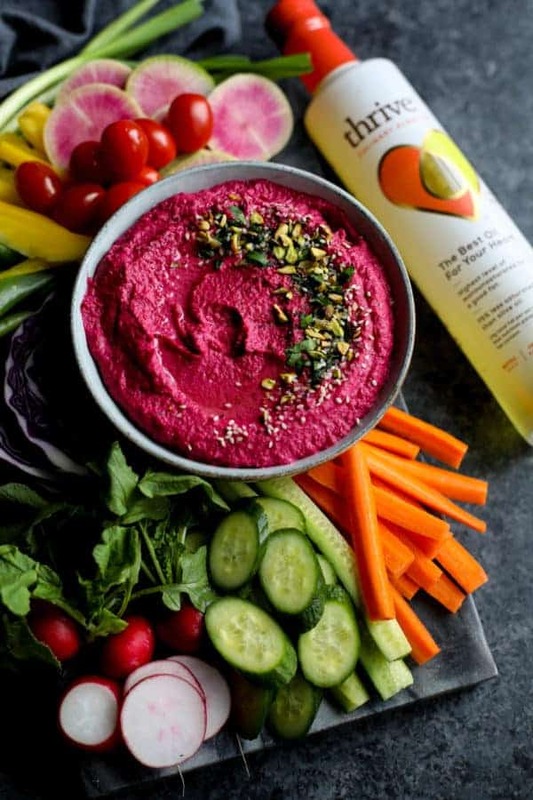 But when we say ‘Drop the beet’ in the kitchen we mean that it’s time to get serious about snacking on this Beet Hummus that’s so insanely delicious and gorgeous and packed with healthy ingredients like beets (obvi), garbanzo beans (aka chickpeas), and heart-healthy fats. Because hellllloooooo fiber, folate, vitamin C and antioxidants that may help lower blood pressure, fight inflammation and improve athletic performance. And hello stunning red color and delicious, slightly sweet flavor that just so happens to make hummus even better. Lately, I’ve been talking to my kids a lot about ‘responsible snacking’. What I mean by that is that a snack should really be a small version of a meal rather than a sweet treat. It should also be comprised of fat, carbs, and protein for maximal satiation and nutrition. 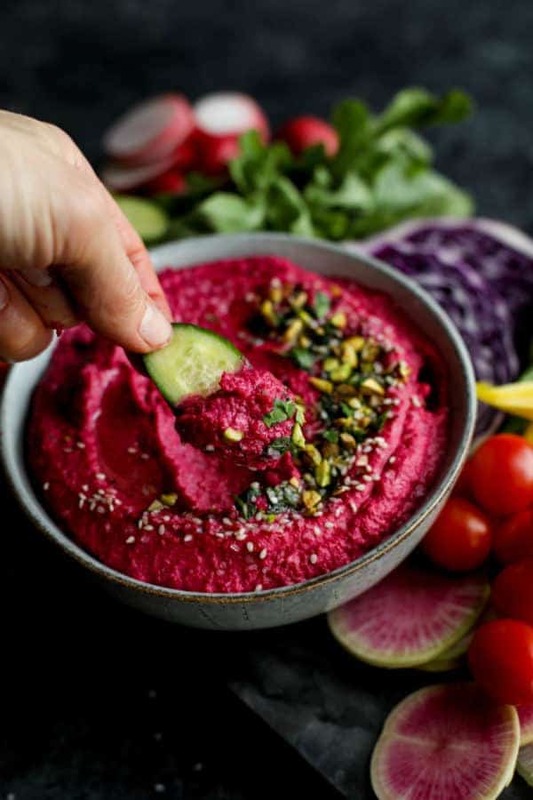 Bonus points for snacks that include vibrantly colored vegetables, fiber, and healthy fats. 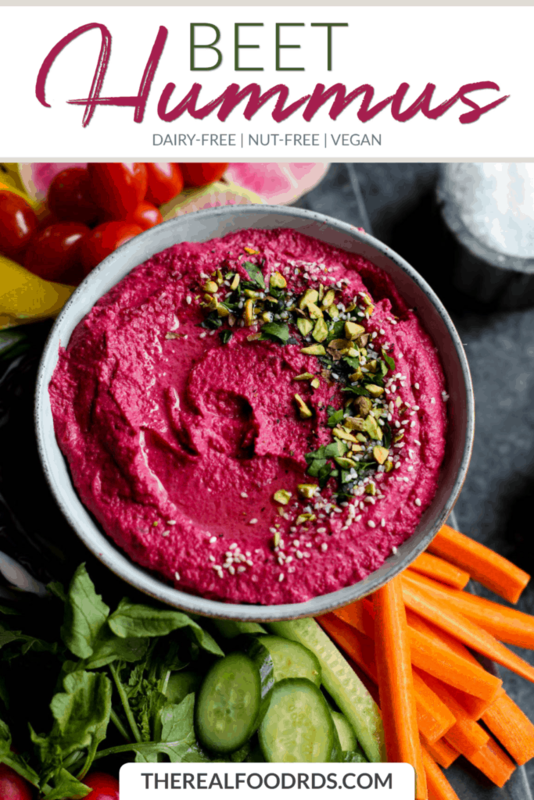 I’d definitely put this Beet Hummus in the responsible snack category thanks to the fiber and protein from the chickpeas, garlic, and beets for the antioxidants and phytonutrients, and healthy fats from the tahini and algae oil. Wait, algae oil? Yes, algae oil. It’s a thing. 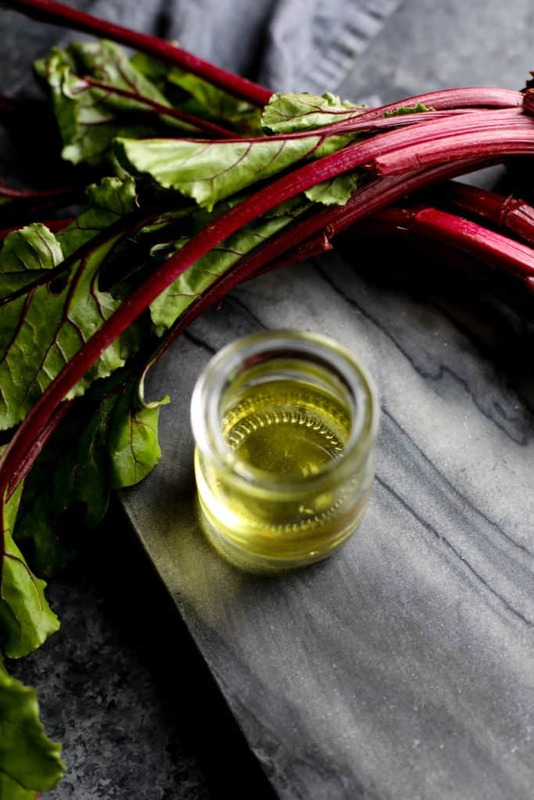 Our friends at Thrive Culinary Algae Oil have created a light, delicious oil that’s packed with monounsaturated fats which help maintain heart health. 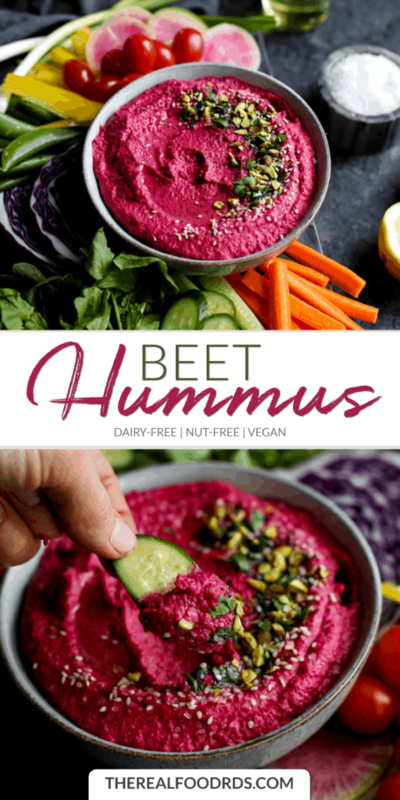 It’s perfect for this beet hummus because it really lets the subtle flavor of the beets shine and makes for some seriously responsible snacking when paired with your favorite veggies or crackers for dipping, dunking, and scooping. 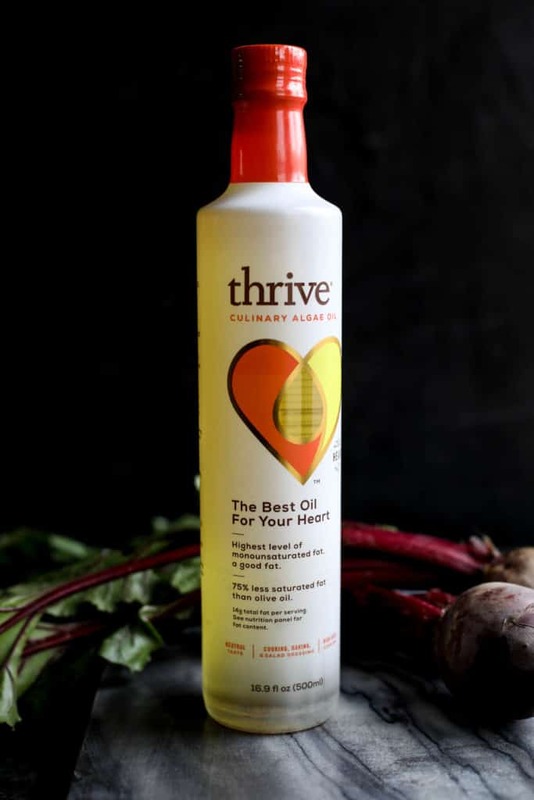 You can learn more about Thrive Culinary Algae Oil, it’s nutrition profile and their focus on sustainability here. If you’ve never made homemade hummus before, let me just say this: it’s about 50 times easier than you think and it’s considerably more budget-friendly than buying it in the store. Plus, you get to control the ingredients and flavors – like more garlic? Add more garlic. You can even get crazy and add in your favorite herbs or spices or sprinkle the whole mess with parsley, chopped pistachios, coarse sea salt and a generous drizzle of oil so that it’s the perfect snacking storm of creamy, salty, silky, and crunchy. Dip ’em if you’ve got ’em! 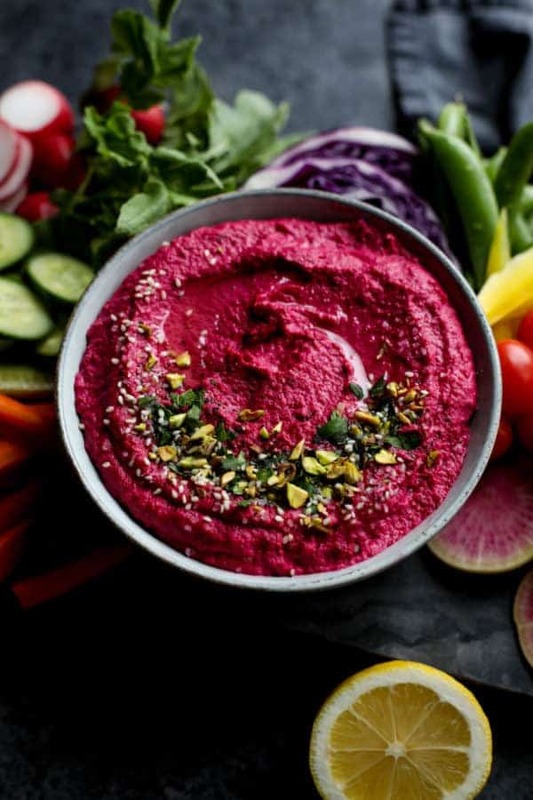 Veggies are, of course, the perfect dipper for this Beet Hummus but your favorite crackers or pretzels work equally well. It also makes a healthy and tasty spread for sandwiches and wraps so get creative and tag us @therealfoodrds when you share your creations on Instagram and Facebook. 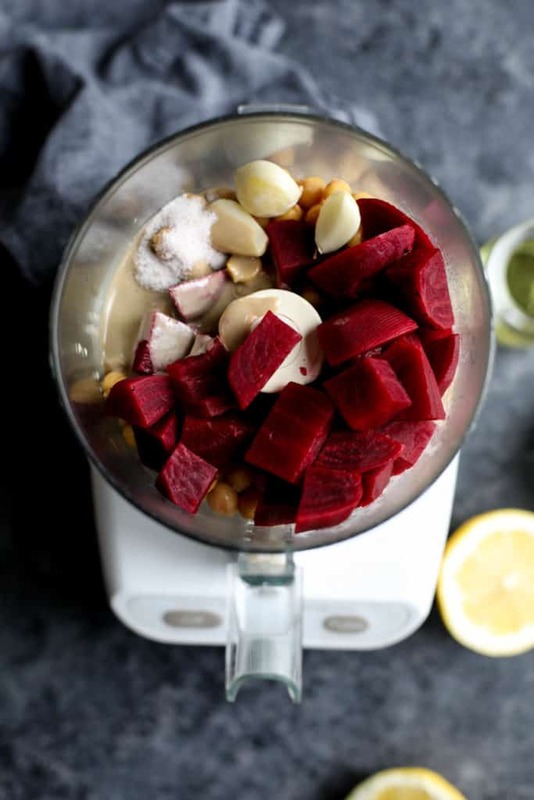 *Cooked beets by roasting or steaming them. 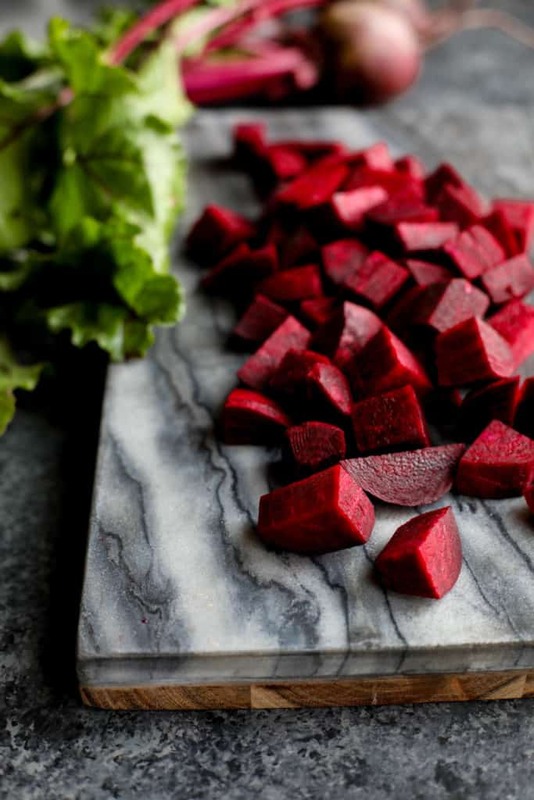 Precooked beets are also a great option to save time. 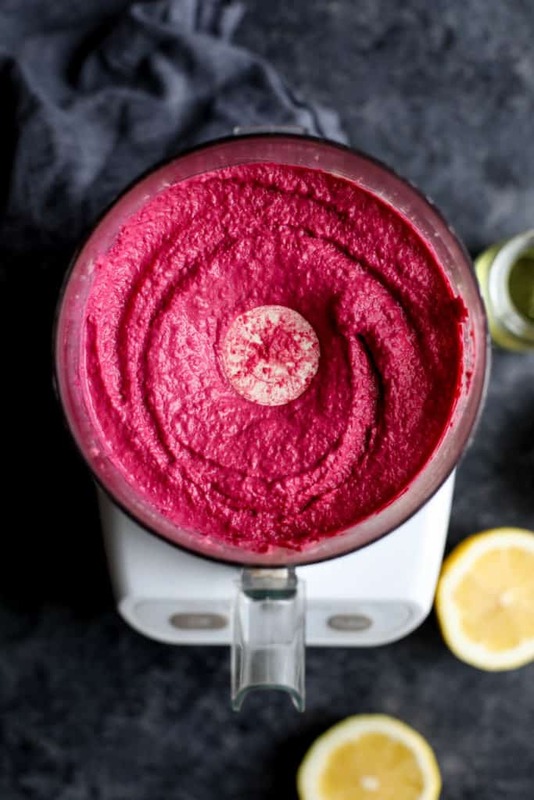 Place beets, beans, lemon juice, tahini, and garlic cloves in the bowl of a food processor (or high-power blender). Add 2 Tbsp. oil and start blending. With the food processor running, slowly drizzle remaining tablespoon of oil through the chute in the lid and blend until smooth, stopping to scrape down the sides as needed. If the hummus is too thick to blend at this point, stream in the reserved liquid from the beans one tablespoon at a time until your desired consistency is achieved. To serve, sprinkle with desired toppings and drizzle with additional oil if desired. 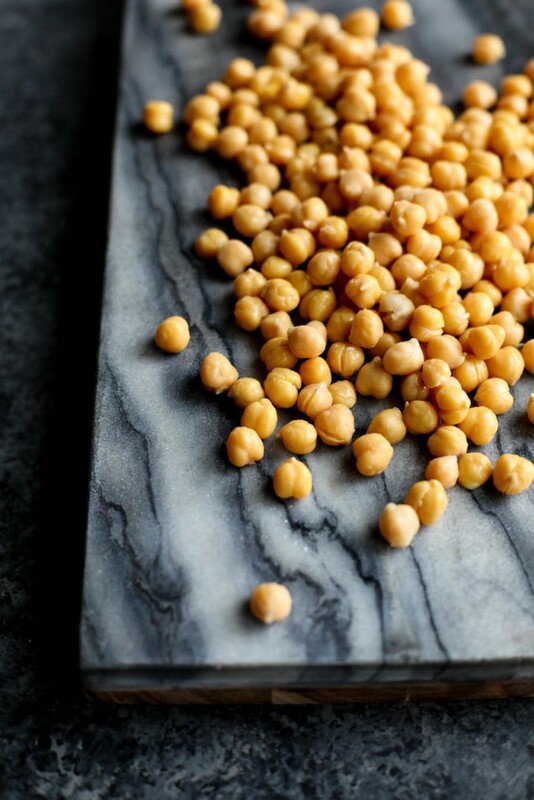 Store unused hummus in the fridge for up to 5 days. What’s your favorite way to ‘snack responsibly’? How do you sneak more nutrients into snack time? Share in the comments below! This post was made possible by our friends at Thrive Culinary Algae Oil. Although we received compensation for this post, the opinions expressed here are – as always – 100% our own. Thank you for supporting the great companies we work with thereby allowing us to continue creating great recipes and content for you.